MyMemories Blog: Meet Feature Designer....Magical Scraps Galore! 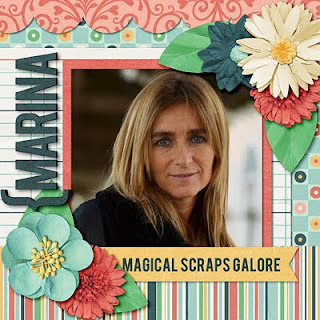 Meet Feature Designer....Magical Scraps Galore! My name is Marina and I'm the creative brain behind Magical Scraps Galore. I live in Argentina with my wonderful husband Peter and our two amazing kids: Emilia (14) and Andrés (13). I’m an animal lover! I currently I have two cats: Calla and Ron. I am an English/Spanish translator and have been working with an American corporation for 22 years. I love designing because it takes me away from the corporate world and it helps me keep my creative juices flowing. I first began traditional scrapbooking back in the 1990’s, until I discovered digital scrapbooking in 2004 and it became my passion. I started designing in 2011. My style is traditional and classic; I love designing theme park inspired kits. And I’m fascinated by colors (though I tend to always dress in black, go figure!). I find my inspiration everywhere: my kids, a photograph, a color swatch ... I have to admit that I spend too much time on Pinterest too! I am loving this creative journey and I’m really honored to have the privilege of helping others preserve their special memories and document their life stories. Be sure to visit Magical Scraps Galore on these Social Sites! It was nice to meet you. I love your products. You are so talented.